Ok, the last two times this ride was rained out. So here it is for one more try and hope for the best. The Ride: This popular ride attracts many cyclists and has become a club classic. It’s perfect for a fine spring, now summer, day. It boasts spectacular scenery, varied terrain and challenging climbs to work up an appetite. 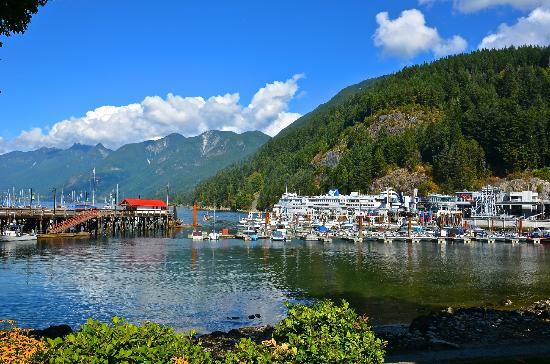 We will across Stanley Park, ride over Lion’s Gate Bridge, ride residential roads skirting the ocean, then join the bike route with its many twists, turns and killer climbs and eventually find ourselves in Horseshoe Bay. Lunch will either be at one of several fine dining restaurants or take your picnic to the waterfront park. We will then return along scenic Marine Drive with a cappuccino stop at Delany’s in West Vancouver. Almost any bike with triple rings and good brakes will do. This entry was posted on Saturday, May 5th, 2018 at 1:36 pm and is filed under Old Rides. You can follow any responses to this entry through the RSS 2.0 feed. You can leave a response, or trackback from your own site.